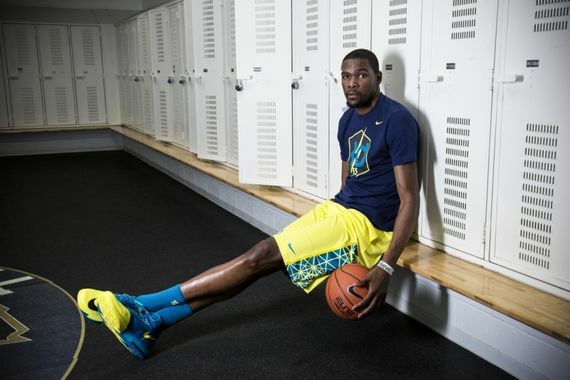 It’s official, the Nike KD VI is here, and Nike Basketball sent out some beauty shots to get you all warmed up to the new design. There’s been a lot of buzz around these bad boys, from a video of KD’s explanation of the design to the announcement that these will soon hit the Nike iD store. There’s a lot that went into these new low-tops, so click through to educate yourself on these brand new kicks, and see them in action. More after the jump. Similar to Durant’s controlled fluidity on the court, a watch operates with precise movements. 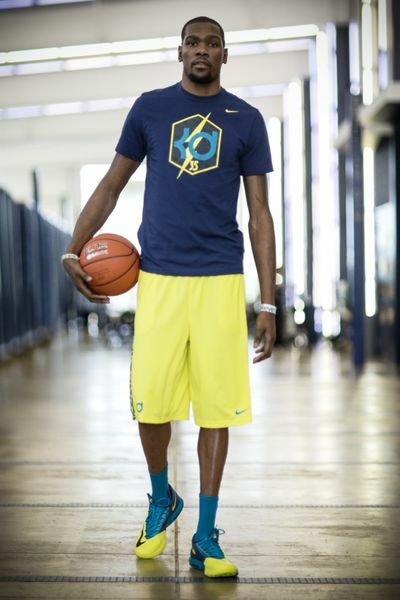 Small nuances in Durant’s style of play and the KD VI design mirror the micro details of a wristwatch. Classic minimalism suggests less is sometimes more. 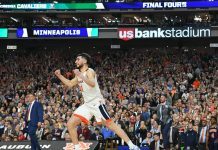 “When Kevin and I first discussed his sixth shoe we wanted to create a simplified design that was bold, beautiful and told a story,” said Chang, Nike Basketball Footwear Design Director. High-speed lateral footwork is critical to sports such as tennis and soccer and corresponding footwear is designed to support this skill-set. 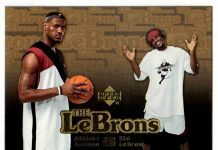 Why not basketball? In analyzing Durant’s need for quickness on the court, Chang landed on a low-profile design that is light in weight and tight to the foot. 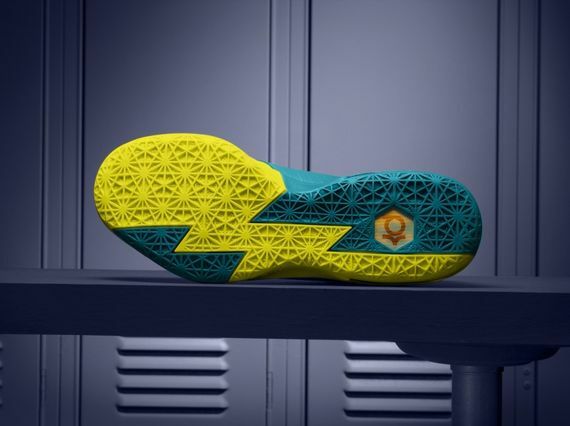 The six-sided hexagonal pattern creates the traction pattern of the KD VI, paying homage to the fact that this is Durant’s sixth shoe. 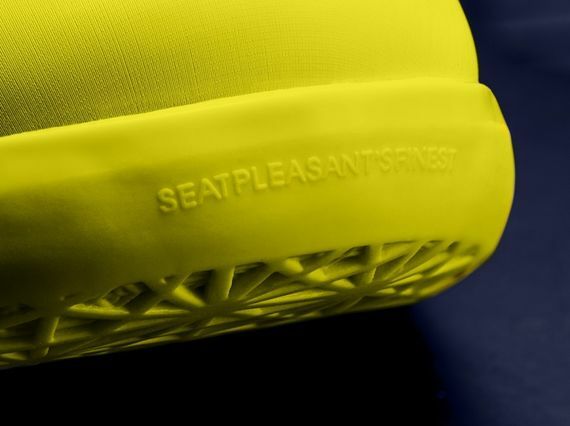 A close look at the shoe’s outsole reveals multi-hexagonal layers. 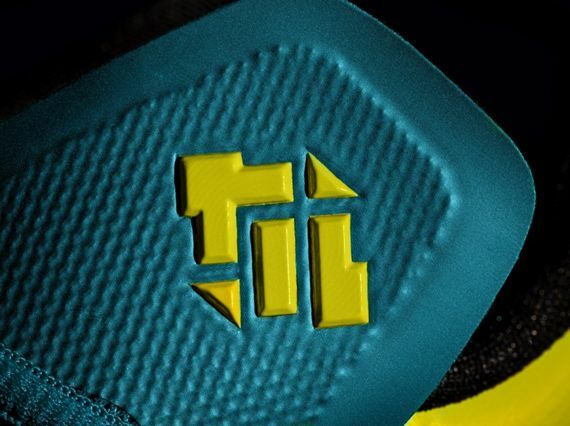 This intricate pattern is designed around the imprint, or pressure map, taken from Durant’s foot as it was scientifically analyzed at the Nike Sports Research Lab. 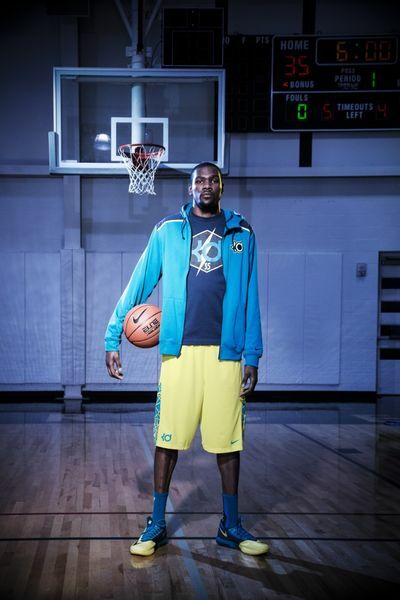 Durant was born and raised in Seat Pleasant, Md., just outside of Washington, D.C. He honed his game after spending countless hours at the Seat Pleasant Activity Center, his home away from home. 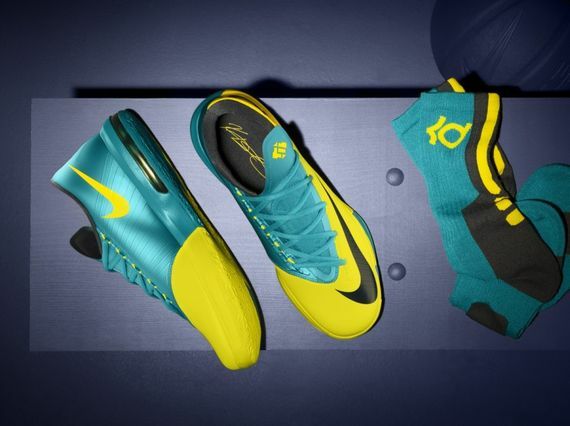 The rec center’s trademark teal and yellow colors, spotted on the center’s doormat by Chang on his first trip to Seat Pleasant in 2008, inspired the lead KD VI colorway launching globally July 3. KD VI D.C. Preheat: The upper features a map of Washington, D.C., overlayed with a white graphic pattern inspired by machining lines of a wristwatch, all in a bold, bright color pattern. 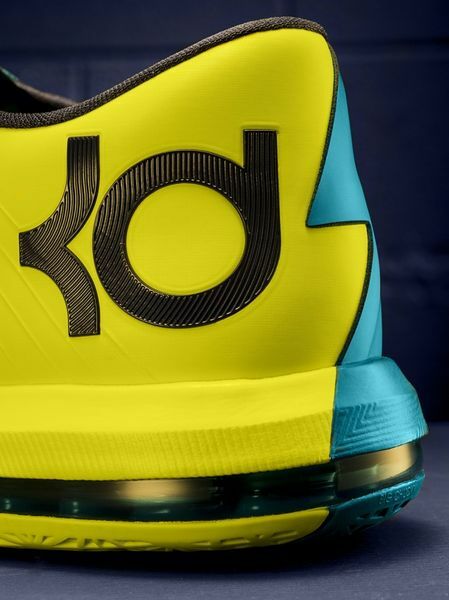 This shoe pays tribute to Durant’s hometown roots. Launch: June 29. KD VI Meteorology: If Durant was not playing basketball, his dream occupation would be tracking weather as a meteorologist. Atomic red, olive and black are featured in a custom graphic mimicking Doppler radar mapping. Launch: Aug. 3. KD VI NYC 66: When Durant scorched the Harlem blacktop and scored 66 points on Aug. 2, 2011, the world took notice. 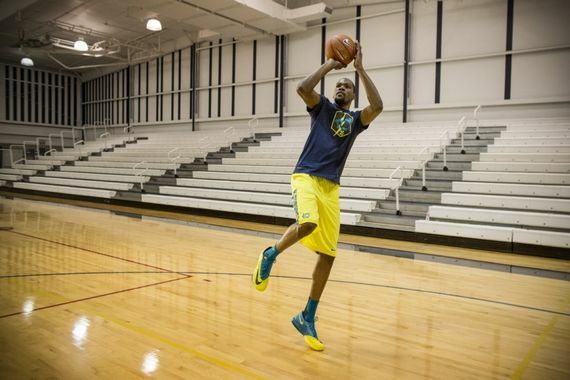 Despite the lockout, basketball didn’t stop for a 22-year-old Durant who’d play anyone at anytime. Launch: Aug. 17. 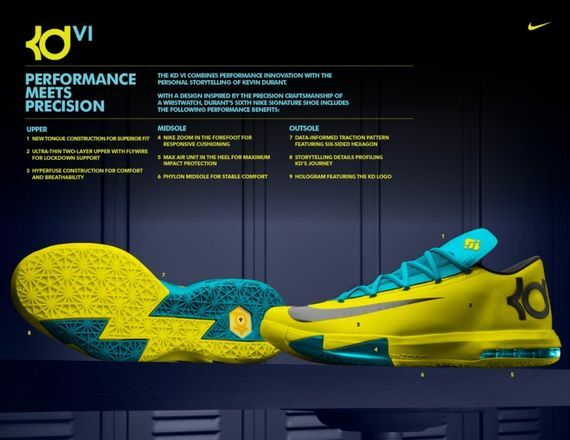 KD VI Bamboo: The power of nature and patience comes to life in Chinese bamboo. Typically after four consecutive years of delicate care, bamboo undergoes a transformation in its fifth year. 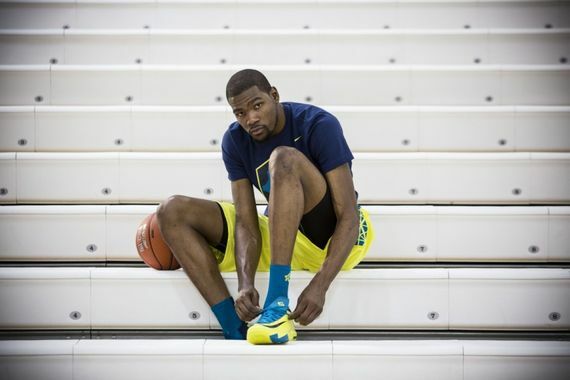 This story parallels the growth of Durant’s game this past season, his fifth in the league. 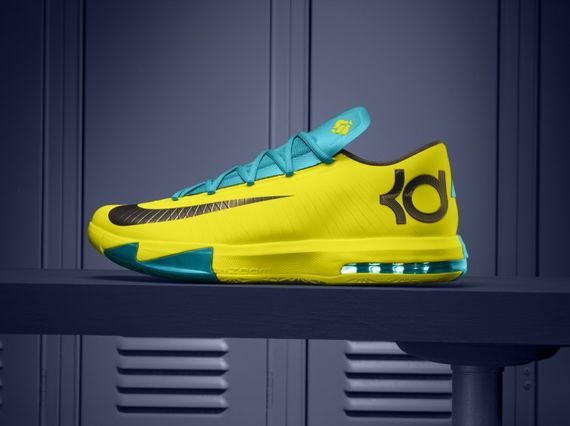 This special green shoe debuts during a summer when Durant will visit China. Launch: Sept. 14. 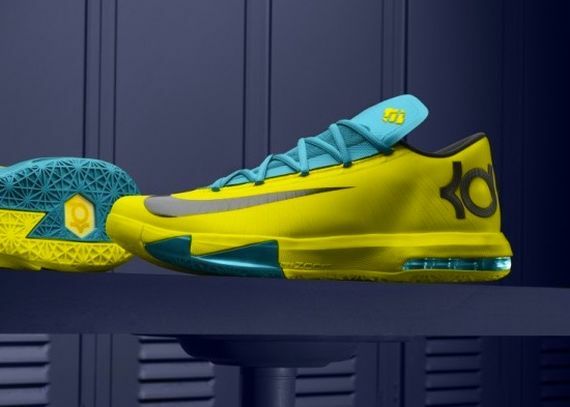 For more information on the above KD VI colorways follow Durant on Twitter (@KDTrey5), Instagram (easymoneysniper) and Vine. 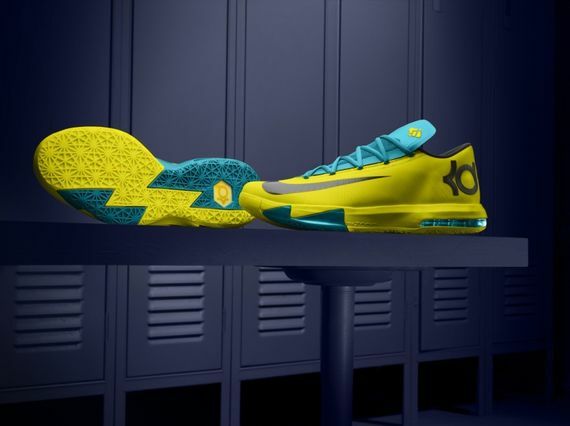 The KD VI is first available in stores in Washington, D.C. on June 29 as Nike celebrates Durant’s hometown roots with an exclusive launch. 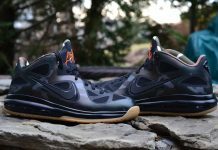 Ths shoe will be available globally at select retailers and Nike.com beginning July 3.